When it is time to replace your home's central heat, you should make sure the new unit is the right size for your household. Putting in a correctly sized heater results in an efficient operation over the heating season. If an undersized system is installed, your house can never heat properly, and an oversized furnace will operate for only short durations without achieving optimum efficiency. Run the numbers - The size of heater you'll need is determined by the area where you live, your average power use, and also the size of your house. Every one of these variables may be used to calculate the appropriate furnace size. Most furnace manufacturers supply similar data for you to compare your requirements to various sizes. Check your current heater's size - Evaluate the heater currently set up in your home. Figure out if it's been meeting your heating demands or if you may require some other size. Compare your house to others - Ask nearby neighbors with similar houses about the dimensions of their central heater. If their units are effectively heating their homes that could be a great place to begin when sizing a heater replacement. Contact an expert - Requesting an on-site visit from a qualified HVAC tech will help you to figire out what size of furnace you'll need. 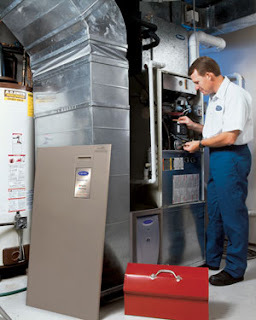 An experienced technician from Sandium Heatnig & Air can visit your home, examine your current furnace, determine the necessary dimensions of a replacement unit, as well as make suggestions for system installation. If you are considering a replacement furnace/heater contact the experts at Sandium Heating & Air. We have been dedicated to serving the HVAC needs of the south San Francisco Bay Area for over a decade and would be privileged to help you out to resolve all of your HVAC needs.